Can iPad be the business device? Some businesses have jumped on the iPad wagon and are finding creative ways to use the iPad. For example, the Global Mundo Tapas restaurant in Sydney, Australia uses the iPad as an interactive menu. There’s a budget airline, Jetstar Airways, using the iPad for in-flight entertainment, rented for $10 a flight. A luxury sedan by Hyundai comes with an iPad instead of a user manual. Other than these extreme cases, how can an iPad be used to increase productivity or convenience by the average business owner? But what about the stack of magazines and newspapers you lug around with you in your briefcase? You could have all of your reading materials ready for you on the iPad and skip the briefcase. Use it as an ebook reader, newspaper subscription, and file storage and you’ve literally got everything at your fingertips. 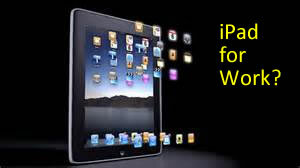 With the use of third party Apps, there’s little you won’t be able to do with the iPad for your business. What Is Machine To Machine Video Analytics?